Got inspired by fvgazi who mentioned here about game programming ideas. First off, some various do it yourself game makers. A very old Gamemaker called Klik n Play, anyone try that one? Maybe a little of Atari 2600 Tank level too. A CRTGAMER exclusive Retro game. Joystick option looks for the old joyport soundcard connection, keyboard works fine. Mame keyboard defaults. Customizing Player 1 and Player 2 keys is also optional. Been a contributing member so thought I would share. Maybe even live in my 15 seconds of fame. Don't worry its not a Virus or Spyware, I wouldn't do that my co-Racketboy members. Its free in VGA color, so enjoy, would love to hear comments. There are additional screenshot Pics a few replies down. Last edited by CRTGAMER on Mon Feb 05, 2018 7:28 pm, edited 17 times in total. 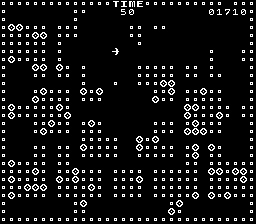 Does anyone want to try my Retro inspired game above? Would love to hear comments. A tutorial and download, what's involved in making a Klik n Play game. Actually not too difficult. The current programs. Free Games Factory download. Last edited by CRTGAMER on Sat Nov 26, 2016 11:50 am, edited 6 times in total. So did you gave my game a try? Arcade Blasto on youtube which inspired me to make a VGA version. Finally got around to putting up screen shots. Apologies for lousy pics, CRT scan shows up on snapshots. F1 brings up a text help screen. F8 shows a menu bar. Click players then the X to change keys. Enjoy my FREE game inspired by BLASTO and SPACE WARS at the OP above. MOUSE CLICK ONE OR TWO PLAYER BOX. F8=MENU, CHOOSE PLAYER THEN CLICK X TO CHANGE KEYS. AVOID THE EXPLODED SUN. SHOOT CHAIN REACTION BLUE BOMBS FOR EXTRA POINTS, MAYBE HIT OPPONENT. GAME OVER. MOUSE CLICK ANYWHERE TO PLAY AGAIN. The Texas Instruments version of Blasto. Link shows an animated SWF file. 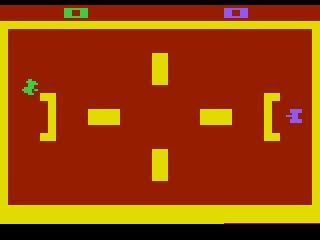 This game is a port of the 1978 Sega/Gremlin Arcade game Blasto, making it one of the earliest Sega arcades brought to the home. You can see in the animation how the bombs explode, sometimes catching yourself or opponent off guard. I implemented this, along with the Spacewars and Combat aspect in my homebrew. According to the Killer List of Videogames, (Arcade version) is considered very rare. A very unique type of gameplay. A reason I made a VGA homebrew version.